This recipe is adapted from Marcus Samuelsson and his New American Table cookbook. It was difficult to photograph the first couple of times I made it, so I had to improvise. The grape ragout is sweet and savory – not much to look at but a lot to taste. 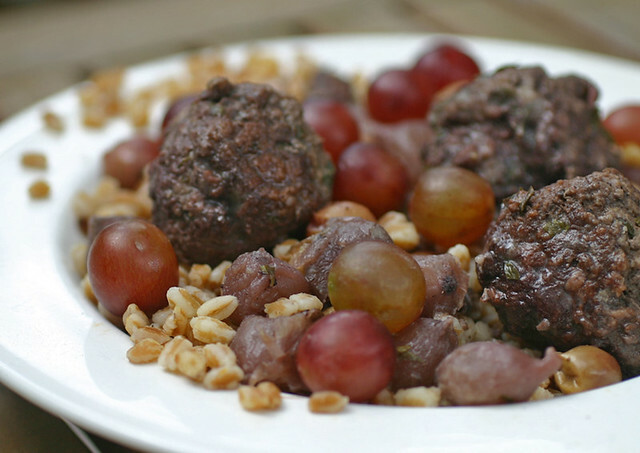 Shape meat mixture into 2″ balls. Saute in frying pan, with oil, browning on all sides. Work in batches – do not over-crowd. Return to simmer for another ten minutes. Place meatballs and ragu in large pan and bring to a simmer to heat through.